There is a huge craze for study in Germany. While the MS programs in Germany get more attention in the media due to the availability of more courses that are entirely taught in English, the undergraduate (Bachelor) programs do not get that much of limelight. In this post, we will look at the undergraduate education in Germany. Get to know about undergraduate courses, top universities, eligibility criteria, application process and job prospects in Germany for Indian and International students. 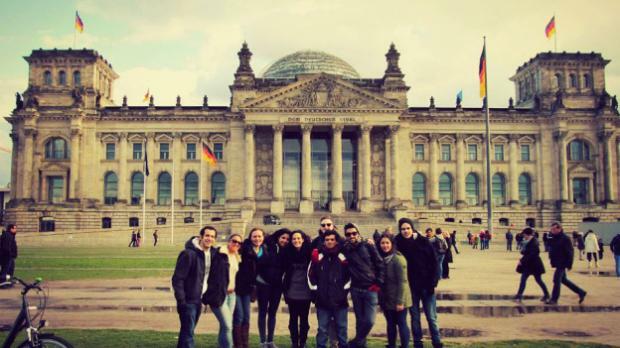 Germany is the 3rd most popular study abroad destination for international students. 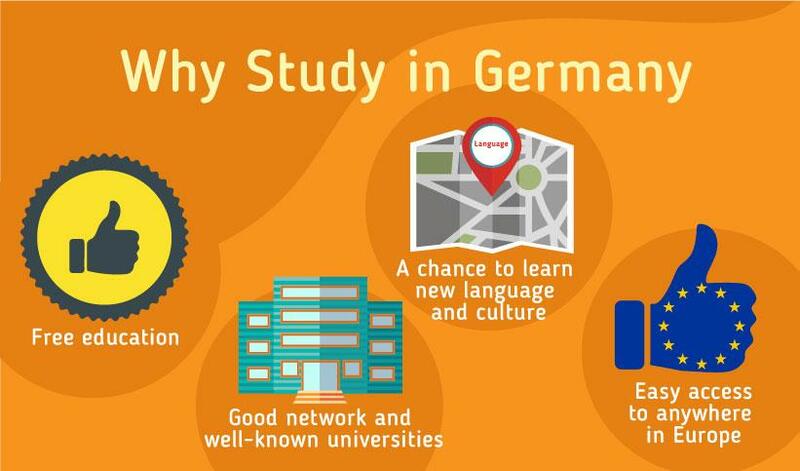 It’s a great place to study since the German degrees are highly respected all over the world Germany has got a rich academic heritage and is one of the leading nations when it comes to technology and innovation. Lastly, you can save a lot on tuition fees while studying in Germany. Most of the German universities are public institutions, charging fees of only around €60-350 per semester for international students, usually to cover expenses associated with the university services (cafes, libraries etc.) and public transport tickets. Germany has got a very open education system, and according to the German law, universities cannot discriminate against or grant preferential treatment to persons on basis of race, ethnic group, gender, social class, religion or political opinion. 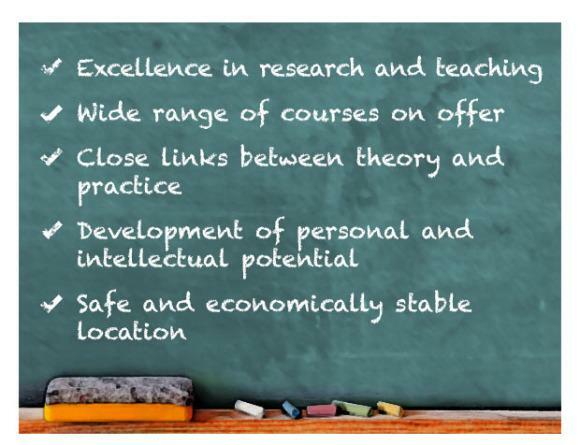 German universities offer excellent teaching, training and research facilities. In terms of world university rankings, 12 German universities feature among the global top 200 universities, while 45 German universities feature among the world’s best. You will earn an internationally recognized degree, giving you excellent prospects on the global job market. German universities provide outstanding degree programs along with practical training in the forms of company internships, work-placements, traineeships, and research projects. You can literally study whatever you like without compromising on the quality of education. Germany is one of the best countries for studying engineering, medicine, natural and applied sciences, business management, humanities, and social sciences. In the last few years, the new-age fields like data science, machine learning, automation, robotics, molecular medicine etc. 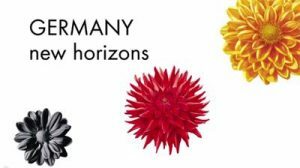 Germany has got a great tradition of science, research, creativity, and innovation. Revolutionary inventions, such as the automobile, the airbag, X-ray technology, Aspirin, the computer, the chip card and the MP3 data compression format – makes Germany a great place for intellectual pursuit. There are almost 70 German laureates in the natural sciences and medicine alone, such as Wilhelm Conrad Röntgen, Robert Koch, Max Planck, Albert Einstein, Christiane Nüsslein-Volhard and Harald zur Hausen. Germany is also known as “land of poets and thinkers” due to figures as Kant, Hegel, Adorno, Goethe, Heine, Brecht, Bach, Beethoven and Brahms. Germany is considered to be the powerhouse in Europe, has got the 5th largest economy in the world. It has got a stable economy, boasts of having one of the lowest unemployment rates in Europe, and the German universities offer excellent job prospects. Germany has got a huge reputation for strong industry-academia linkage, and a lot of scientific research is funded by the industry. International students who wish to work in Germany after studies can extend their residence permit for up to 18 months to find a full-time job related to their field of studies. Know more about the post-study work permits. After the implementation of the European Union (EU) Blue Card system by the German parliament, international students will have unrestricted access to the job market in the whole EU region. Since 2014, all public universities in Germany offer free education to both local and international students. There is a semester fee, which is very nominal. At present, an international student needs to pay something between EUR 250 to EUR 650 per semester. Although the public universities will re-introduce the tuition fees (starting 2017), it would still be less expensive than another popular study abroad destinations. All non-EU students taking up places in German institutions will be required to pay fees of €1, 500 (~INR 1.2 Lakhs) per semester from 2017. So, as an international student, you can complete your Bachelor’s degree within INR 3 – 6 Lakhs (excluding living expenses). Along with top quality education, you will also get to experience bustling cities, beautiful landscape and people from all over the world. 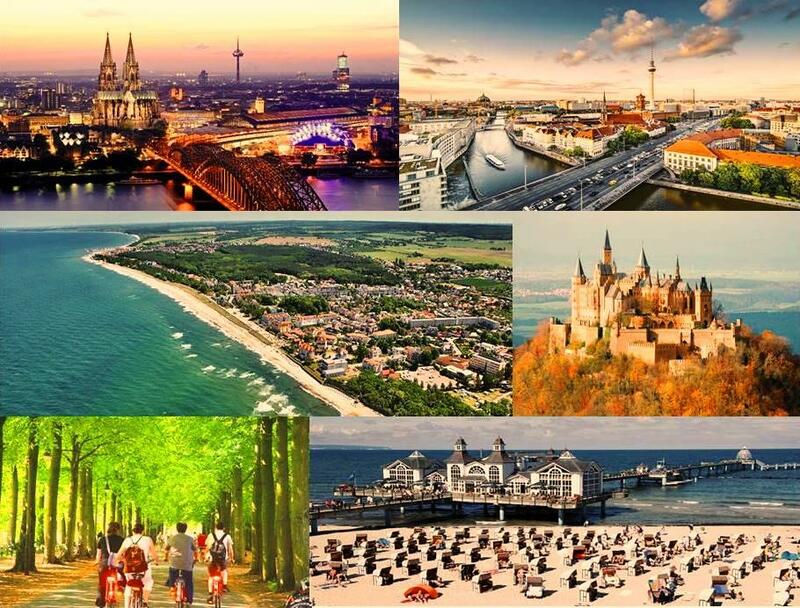 Germany is a country of diverse landscapes and exciting cities. The university towns range from large and vibrant cities to quieter towns and provide a great option of studying and living. If you want to have some time off, you can go to museums, cinemas or theatres, go for a cycle ride, sit in a beer garden, go for a walk on a beach, swim in a lake, climb a mountain or visit an old castle. Germany has been a land of immigration since the 1960s. Today, it is home to 6.9 million (8.5% of total population) people of immigrant descent. Germany is a safe country for international students and is a tolerant and cosmopolitan country. At present, undergraduate studies are free for all at the public universities. However, finding free English-language programs at public universities is not easy. The majority of undergraduate courses at German universities are taught in German. According to the DAAD database, there are 98 bachelor programs in Germany that are taught entirely in English, including 55 bachelor programs without any tuition fees. If you go to Study-in.de, you can find 196 undergraduate programs that are taught in English. 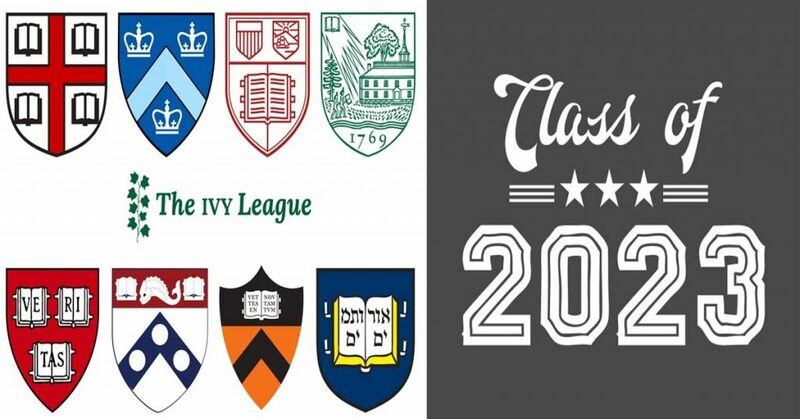 Some of these are offered by the private universities, which charge tuition fees around €10, 000 – €15, 000 (~US$10, 500 – US$16.625) per semester. Living expenses are in the range of EUR 600 to EUR 850 per month, depending on the location and your lifestyle. As an international student, you are permitted to work for 120 full days or 240 half days in a year. This will help you in getting a bit of extra pocket-money. You do not need to pay any tax if you are earning less than EUR 450 per month. You could also look beyond the top universities, and explore institutions that are perhaps smaller, specialized or vocational in focus in order to study undergraduate programs in English without paying any tuition fees. Technical Universities (TU) or normal universities (also known as Techniche Hochschule) are more research-oriented and offer a wide variety of subjects. In contrast, Universities of Applied Sciences (also known as Fachoschule) are more industry/practical oriented. They offer courses mainly in engineering, business administration, social sciences, and design. You will get more opportunities to intern in top companies. Lastly, they do not offer PhD degrees. But, students from these Universities are equally eligible to pursue PhD elsewhere upon graduation. Although TUs have got better rankings on QS or THE, the Universities of Applied Sciences are no way inferior in terms of education, training and job prospects. Undergraduate courses usually start in September/October. You should start your preparation one year in advance. If you need to attain the B1/B2 level German language proficiency, you might need to start earlier (Class 10/11). Shortlist 8 – 12 universities that you would like to apply to by March. 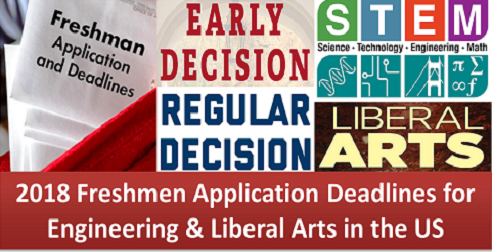 The application deadlines are usually during May – June. In Germany, every university is autonomous, and each university (even a few specific courses) has its own set of admission criteria. 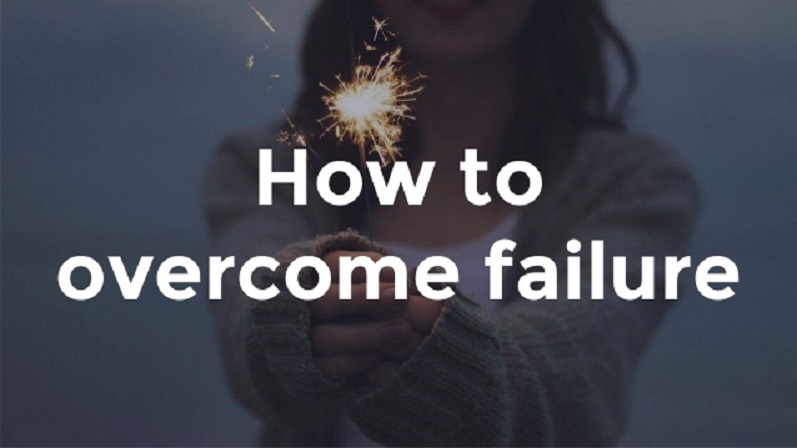 So, you need to check the university website, and specifically the program you are interested in to find out the exact admission requirements. The minimum eligibility criteria to study Bachelors in Germany are valid school leaving certificate (12th) with a relevant subject combination and proof of language (English and/or German) proficiency. You might also need to appear for an entrance exam (Aufnahmeprüfung). You need to apply either to the university directly or to UNI-ASSIST (the University Application Service for International Students). Few universities might also ask you to appear for Skype interviews. Ideally, you need excellent grades in your high school in order to study Bachelors in Germany. If you want to attend programs taught in German, you need to have German language proficiency of B1/B2 level. In order to meet the German language requirements, you will need to appear for the DSH exam (Deutsche Sprachprüfung für den Hochschulzugang) or the TestDaF (formerly Test Deutsch als Fremdsprache, meaning “Test of German as a foreign language”). You will also need to appear for IELTS or TOEFL as well in order to meet the English language requirements. · Passing the qualification assessment examination in Germany, called Feststellungsprüfung (FSP). 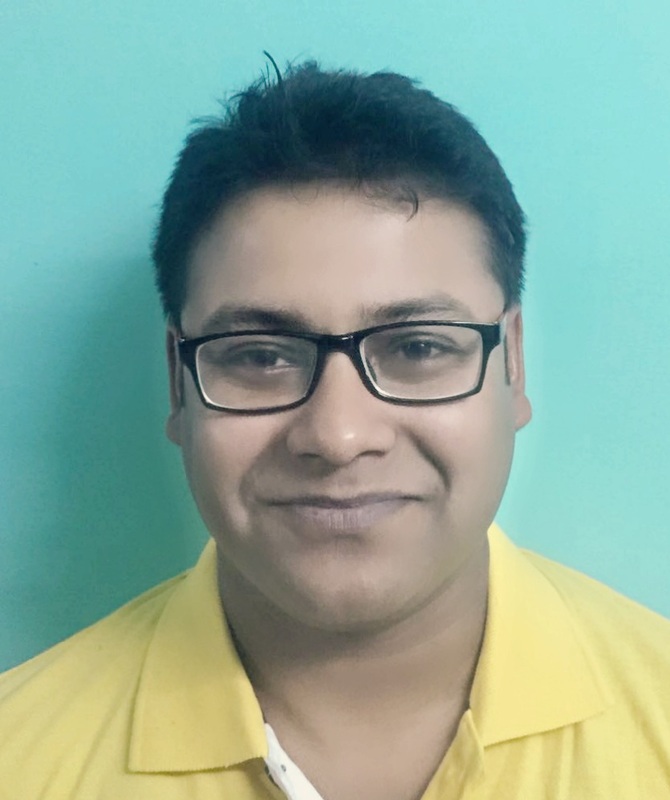 · Successfully completing the first year of a bachelor program from a recognized university in India in the relevant subject field. · Successfully clearing the IIT Joint Entrance Examination for admission to courses in technology and natural sciences. An assessment test by a Fachhochschule only qualifies you to study at a Fachhochschule, not at a university. An assessment test by a university qualifies you to study at both types of schools: universities and Fachhochschulen. In case of failure, the Assessment Exam (Feststellungsprüfung) can be taken once more – and only once more – at the earliest 6 months later. You can take the Assessment Exam only after having attended the foundation year at the Studienkolleg. Sufficient pre-knowledge of German (B1 level) (A few universities offer a language course before the preparatory course, which then counts as proof). 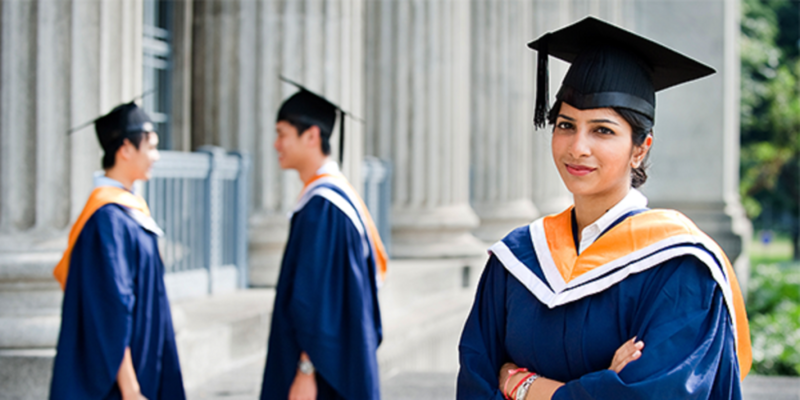 Know more about the Foundation Courses (also known as Preparatory Courses) in Germany. If you have got any queries regarding study in Germany, or need assistance with applications for admission in Germany, please feel free to book a 1:1 Counselling Session. While finding and applying to subject areas like engineering, science, business management, arts & humanities are comparatively straightforward, the application and admission procedure for Medical studies in Germany is a bit complex one. Unlike other countries, there are no separate undergraduate and postgraduate programs for Medicine in Germany. 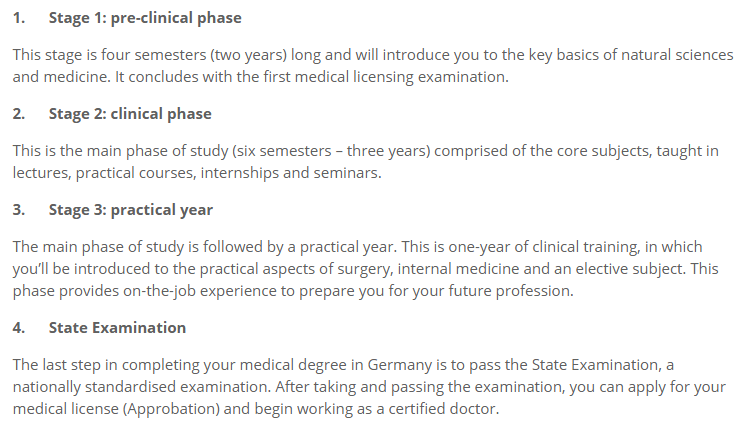 It takes at least six years and three months to finish a Medical degree in Germany, and that concludes with the State Examination (after which you can apply for the license for practicing medicine). Later on, you could continue your education to become a “medical specialist”, which, depending on the subject of specialization, can take another three to six years. There are 30 different areas of medicine in which you can specialize. Medical specialist training programs are not degree programs. These are not offered at any university or institute. You will work as a doctor in full-time employment, e.g. at a doctor’s practice, a university clinic or medical center or other “institution authorized to provide medical treatment”, and will be paid as an assistant physician. Medical school admissions are centrally coordinated in Germany. The best way to know about the admission procedures would be contacting the university of your choice at least 12 months in advance. 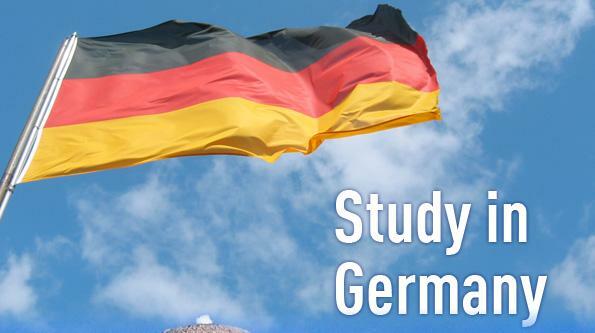 You must know the German language in order to study Medicine and other German-taught programs in Germany. You can obviously learn the German language in your home country. But, it could be a nice idea to travel to Germany and take the language courses in Germany itself, especially the advanced ones like B1, B2, C1 or C2. These courses usually take place between June and September. Alternatively, you could spend a year in Germany as part of a youth exchange program. You could stay with a German host family, attend a local high school and beef up your German language skills. The German language proficiency will not only help you to get admission at the universities but will also enhance your job prospects in Germany. You might also like to know the Top Engineering Colleges from around the world for International students.